The 10.5-cm enamel dial has Roman numerals for the hours and Arabic numerals for five minute indication. 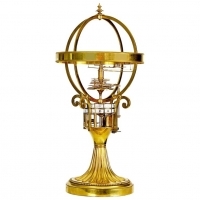 The centre is signed Etienne Lenoir A Paris for the clockmaker. The beautifully shaped hands are made of gilt brass. The movement is driven by a spring barrel and has a duration of eight days. It is being regulated by a ‘Chevalier de Bethune’ escapement in combination with a silk suspended pendulum. The clock can repeat the hours and quarters by means of pull quarter repeating on two bells. One winds a small auxiliary spring barrel which activates the quarter repeating. The fire-gilt (ormolu) bronze case is throughout decorated with scrolls, shells and flowers. It is a fine example of the French Rococo. The bronze is exceptionally well cast and chiseled. The Saint Germain signature is on the bottom of the case which is surmounted by leaves and flowers. The sides have trellis over red silk and it is placed on scroll feet. These are placed on a matching base with a geometrical pattern. Jean-Joseph de Saint-Germain was one of the most famous Parisians of his age. He started working around 1742 but became Master in July 1748. He is renown for his gilt bronze clock cases and is one of the most important designers of the Rococo style. Many museums have pieces of him in their collection. Besides clock cases he made bronze mounts, chenets and candelabra. All is his work is testament of his enormous skill as chiseller and gilder. He stopped working in 1776. These are a few of the Museum that have work by him; Louvre Museum Paris, Musée des Arts décoratifs Lyon, Amalienborg Palace Copenhagen, the Gulbenkian Foundation Lisbon, Metropolitan Museum New York. 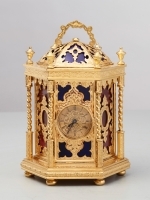 A similar clock mounted on a music box is depicted in Ottomeyer & Pröschel, Vergoldete Bronzen I, pp. 126. Etienne Lenoir became Master clockmaker in 1717 around his 18th. He worked together with his son Pierre-Etienne who was born in 1724 and became clockmaker in 1743. From that year on they both are recorded working at the Quai des Orfèvres. 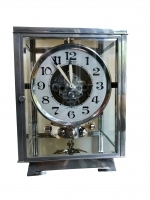 Many of their clocks are in Museums and good collections. (Lit. Tardy, Dictionnaire des horlogers français, pp. 376.